Adding solar panels to your roof can be frustrating, since it’s often difficult to know if your home receives enough light to justify the investment. Google Maps, however, has satellite, navigation and sunlight data for every property in the world, so it’s ideally placed to tell you how many rays hit your crib on a daily basis. 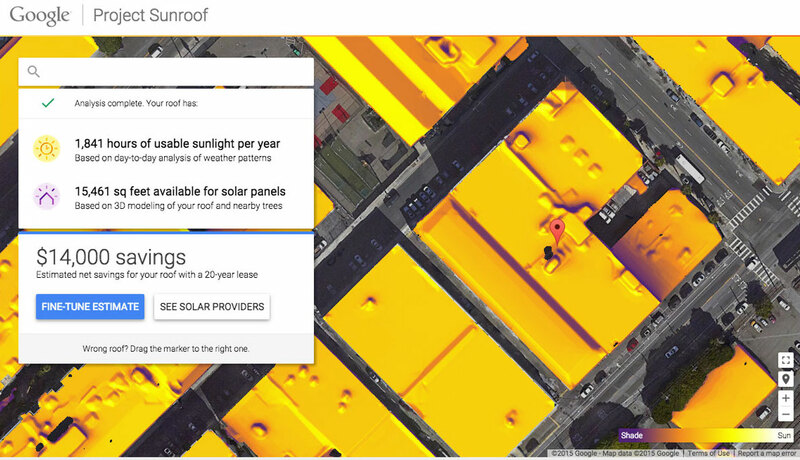 That’s why the firm is launching Sunroof, a database of how much solar energy hits each building in a city, helping people work out if it’s worth the effort. Sunroof is intended as a “treasure map” for future green energy projects, telling you how much of a saving you’d make and how long it’d take to make back your initial outlay. To begin with, Project Sunroof will only be available in three locations: Boston, San Francisco and Fresno. If it turns out to be successful, however, then Google will roll the service out to the rest of the country and, possibly, the world. Once you’ve put in your address, you’ll be told how much you’re likely to save in energy costs, and then be put in touch with a local installer. We tested the service out on Aol’s building in San Francisco, and it told us that we received 1,840 hours of usable sunlight per year. In addition, we learned that we have roughly 15,641 square feet of available space that we could use to install solar panels. It then took us through our options, letting us know that we’d save $14,000 if we leased the hardware, or $24,000 if we bought them outright. So, if you’re in one of these three areas, why not share how much Google thinks you’re likely to save and if that’ll prompt you into signing up.